We arrived in Dubai after an overnight flight. transfers were smooth and arrived at cruise port by 10.30am Cabins were ready by 11.15am- Great start to the holiday. Day 1 First port of call was Bahrain - a very enjoyable excursion to the F1 Track. Second Stop was 2 days in Abu Dhabi - first day Shuttle bus took us to a newly finished Mall on the outskirts of town, quite disappointing as there was no way of walking to the main part of town, bit of a wasted day really. 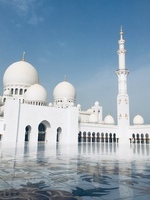 Second day we went on a cruise excursion to Grand Mosque- a visit to a traditional handmadecrafts village, great opportunity to buy local crafts - trade in Diram, Euro&apos;s and Dollars. Very friendly and look out for the man that does weaving really worth a visit.A drive around the sites of Abu Dhabi and then a final visit was to a Fort .. this was a superb tour and I would really recommend it as we saw lots and it was good value at £40 each. A day at sea followed . Our next visit was to Muscat , here the shuttle bus took us to a market and we explored the town and the harbour. It was a little confusing at the port we had to get off the bus and go through a security check before re-boarding the bus to get to the town. If you are feeling a bit more adventurous there is a beautiful beach a short taxi ride from the port. We then visited Kushab, a lovely little town where goats roamed the streets and there was a wealth of electronic shops selling allsorts... My daughters bought a pair of airpods that work great for £20, from a shop in the square where the shuttle bus dropped us off. We also found a beautiful beach just next to the port and the sea was really warm, there is no pavement to get there so you need to bear right out of the port and follow the track ..walk behind the crash barrier to the beach , it&apos;s less than 1/2 a mile walk. We then enjoyed a fun day on the beach at Sir Ban Yas Island- The ship provided a great packed lunch and drinks on the beach. 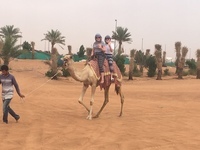 Our final stop was a return to Dubai, where we arranged our own excursion through Arabian Nights Tours, we had a great great time our guide was called Ramzan and he took us camel riding ( just a quick walk around a pen but good photo opportunities), Sand boarding and Dune Bashing these were both brilliant. He also told us loads about Dubai and its culture. 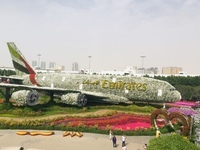 We then took a taxi to the Miracle Gardens, this is a must see for anyone visiting Dubai. The shuttle bus took us to the Dubai Mall where we walked to the burj khalifa and the dancing fountains - we also saw the amazing huge fish tank in the Mall with sharks, stingrays and dozens of amazing fish. Our final day a thick cloud descended on the whole area so it scuppered our plans to visit the palm as we would not have been able to see anything- but we feel this is a good excuse to visit again. Great holiday, excellent value with P&O , having sailed with Princess, Celebrity, Cunard and Royal Caribbean in the past, I would have no hesitation in sailing with P&O again , the Oceana was very friendly and offered really good food. We traveled as a family of 6 with 2 teenage girls, we felt extremely safe throughout our holiday and everyone was very friendly. We arrived in Dubai after an overnight flight. transfers were smooth and arrived at cruise port by 10.30am Cabins were ready by 11.15am- Great start to the holiday. Day 1 First port of call was Bahrain - a very enjoyable excursion to the F1 Track. Second Stop was 2 days in Abu Dhabi - first day Shuttle bus took us to a newly finished Mall on the outskirts of town, quite disappointing as there was no way of walking to the main part of town, bit of a wasted day really. 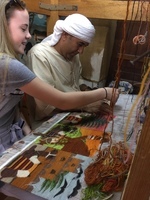 Second day we went on a cruise excursion to Grand Mosque- a visit to a traditional handmadecrafts village, great opportunity to buy local crafts - trade in Diram, Euro&apos;s and Dollars. Very friendly and look out for the man that does weaving really worth a visit.A drive around the sites of Abu Dhabi and then a final visit was to a Fort .. this was a superb tour and I would really recommend it as we saw lots and it was good value at £40 each. A day at sea followed . Our next visit was to Muscat , here the shuttle bus took us to a market and we explored the town and the harbour. It was a little confusing at the port we had to get off the bus and go through a security check before re-boarding the bus to get to the town. If you are feeling a bit more adventurous there is a beautiful beach a short taxi ride from the port. We then visited Kushab, a lovely little town where goats roamed the streets and there was a wealth of electronic shops selling allsorts... My daughters bought a pair of airpods that work great for £20, from a shop in the square where the shuttle bus dropped us off. We also found a beautiful beach just next to the port and the sea was really warm, there is no pavement to get there so you need to bear right out of the port and follow the track ..walk behind the crash barrier to the beach , it&apos;s less than 1/2 a mile walk. We then enjoyed a fun day on the beach at Sir Ban Yas Island- The ship provided a great packed lunch and drinks on the beach. Our final stop was a return to Dubai, where we arranged our own excursion through Arabian Nights Tours, we had a great great time our guide was called Ramzan and he took us camel riding ( just a quick walk around a pen but good photo opportunities), Sand boarding and Dune Bashing these were both brilliant. He also told us loads about Dubai and its culture. 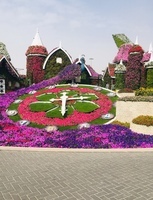 We then took a taxi to the Miracle Gardens, this is a must see for anyone visiting Dubai. The shuttle bus took us to the Dubai Mall where we walked to the burj khalifa and the dancing fountains - we also saw the amazing huge fish tank in the Mall with sharks, stingrays and dozens of amazing fish. Our final day a thick cloud descended on the whole area so it scuppered our plans to visit the palm as we would not have been able to see anything- but we feel this is a good excuse to visit again. Great holiday, excellent value with P&O , having sailed with Princess, Celebrity, Cunard and Royal Caribbean in the past, I would have no hesitation in sailing with P&O again , the Oceana was very friendly and offered really good food. We traveled as a family of 6 with 2 teenage girls, we felt extremely safe throughout our holiday and everyone was very friendly. The cabin was a decent size and well maintained, everything worked and was nice and clean. Small down side just one plug but they did also have a hairdryer/ kettle point. Dhon was our cabin steward, extremely friendly and helpful . (The children enjoyed the ship but did not join any of the kids clubs). on another day - Shuttle bus to Mall was a bit disappointing.